My daughter and I recently took a daytrip to my niece’s house close to the South Carolina border. When I left my house about forty-five minutes north of Atlanta that morning heading to my daughter’s house in Atlanta, it was drizzling. By the time we got on the highway, it was like a monsoon outside. We almost changed our minds about going to see my niece because visibility was ZERO. 18-wheelers were everywhere, and the mist coming up from behind them made it impossible to see any taillights in front of us. I was already a nervous wreck, and we’d only been on the road about fifteen minutes. We finally reached the point where we weren’t able to go on, so we stopped for lunch. We prayed and asked God make the storm go away so that we could see to drive. By the time we got back on our way, most of the rain had stopped except for just a light drizzle—like what I had encountered earlier that morning. Travel was still difficult because the roads were so wet, but at least we could see in front of us. We eventually made it to my niece’s house much later than we’d originally planned and so our visit was cut short. We headed back to Atlanta early to avoid the afternoon traffic. We had gotten about thirty minutes down the road when the weather turned horrible again. Visibility was less than zero this time. Cars had their flashers on, and they were going very slow. My fear was making my daughter more nervous than she already was. (She broke her back five years ago after hydroplaning in the rain, so we’re always a little bit nervous on days like this). I began to pray again asking God to stop the storms. I asked Him to keep us safe and to help us get back to the house without the rain. But this time, He chose not to stop the storms. In fact, He chose not to lighten the storms at all. It seemed like the storm just intensified. There was standing water on the road, and cars were going dangerously slow because the drivers couldn’t see, becoming a hazard to other drivers. I wanted to pull off the highway and wait the storm out, but there was no way to know how long it would last. We had to press on. When we got close enough to my daughter’s exit in Atlanta, we got off the highway. But the side roads weren’t much better. We finally made it back to my daughter’s house, and I didn’t want to get back on the road to go to my house. I had another hour or more ahead of me, and I was drained. As I got closer to home, it was almost as if it hadn’t even rained there. I arrived safely, got myself a cup of coffee, and recovered, thankful that we’d pressed on and had the wonderful time with our family. It’s this way in many real life situations. Sometimes God removes the storm from our lives. Sometimes He makes us go through it because He knows it’s for our good. But He’s always there with us. 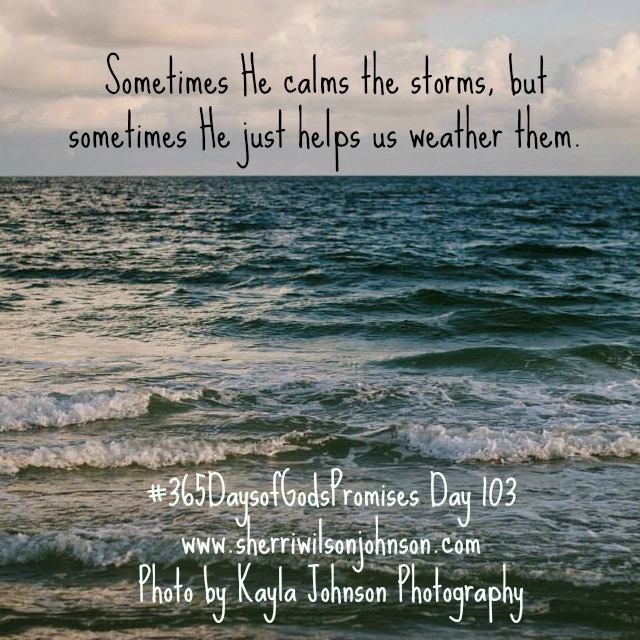 God did not stop the storm that day. He didn’t get us out of the storm either. We had to weather it. But we did so together. On the way to my niece’s house, He lightened the load, but on the way back, He didn’t. While we were on the road, I never felt that God wasn’t there protecting us. Even though I continued to pray and some of the time I kept my eyes closed, I believed that He was there. I actually knew that if we were involved in an accident, He’d be with us through that as well. The beauty of God is that sometimes our situations don’t change–sometimes they even get worse–but He’s always there with us. While reading this, I was reminded of how I dread to travel through Atlanta. It is a difficult trek without the rain! Knowing that part of I-75 made your story resonate with me even more. Thank you for the reminder that God is ever with us in our time of need.